Expert speakers in this free webinar will address the real issues caused by energy volatility and regulation across Europe. Industry-leading speakers from Heinz and Ineos will explain how real initiatives have delivered genuine results across Europe. 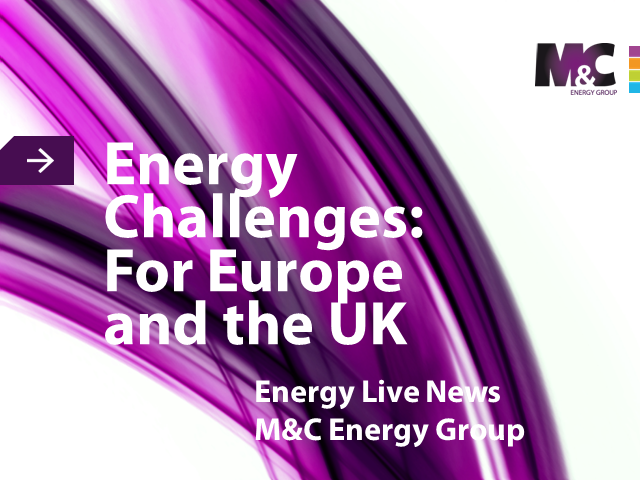 Mark Dickinson, M&C Energy Group's Chief Exec, will discuss how a total view of your energy procurement strategy across markets can benefit your whole group. This free webinar, hosted by Sumit Bose from Energy Live News, also gives YOU the chance to pose your questions to our expert panel. A conjuntura atual permite economia de até 40% para as organizações que optam pelo mercado livre de energia, administrado pela Câmara de Comercialização de Energia Elétrica (CCEE). Sustainability reporting has become an increasingly important issue as stakeholders seek transparency from the organizations they support. Throughout Europe, mandatory reporting programs such as non-financial reporting and article 8 of the EED have taken shape through EU directives and have become a part of standard operating procedure for impacted organizations. While primarily a voluntary activity (GRI, CDP, GRESB) in the United States, sustainability reporting continues to gain momentum and support. For this webinar, we’ll be joined by two leading, global organizations and will learn why they report, what programs they report to, and how they are turning reporting into action. All you need to know about the energy market in minutes, join our team of experts for a short market update over coffee! Did you know retailers who leverage the full power of big data could increase their operating margins by as much as 60%! Join our experts, Louise Wallis and Christopher White, as they discuss the energy big data challenges and uncover how you can achieve consumption and cost reduction through data analysis and right actions. Would you like to save 9.7% of your energy spend or more? In this webinar, we'll discuss ways you can achieve energy savings and share practical tips on how to prioritize the projects you know you want to do and help you get started with a list of those projects that will deliver maximum return on investment or time committed. In this session, we’ll be joined by representatives from Hewlett-Packard (HP), IKEA, and Owens Corning to discuss their organizations’ commitment to renewable and clean energy technologies. They’ll discuss how these technologies are helping them to improve their overall energy and sustainability programs, and how they achieved internal buy-in to pursue these alternative energy programs. Join us on Oct 8 at 2pm EDT. In this session, moderated by Schneider Electric, we’ll take an inside look at the solutions powering the Renewable Revolution. We’ll be joined by NextEra Energy Resources, Bloom Energy, and SolarCity who will provide their insights, analysis, and outlook for the renewables and cleantech market. You’ll learn about the technologies and solutions they have developed and how they have helped end-users further their cleantech and renewable initiatives. Join us on Sept 22 at 11am EDT. In this session we’ll examine how renewables and other clean technologies such as storage and fuel cells have shaken up the energy markets and how companies can join the rapidly growing “revolution.” We’ll look at current and evolving technologies and how companies are realizing significant financial savings, risk mitigation, and cost certainty through comprehensive renewable energy programs. We’ll also explore current savings opportunities available in various regions of the world. Join us at 2pm EDT on August 18. Join Verdantix and Schneider Electric at 11AM EDT, 4PM BST on Monday, June 22nd, as we discuss strategies to solve enterprise energy and sustainability data management challenges. Ahora tiene una buena oportunidad de lograr ahorros significativos debido al entorno de bajos precios actual en los mercados energéticos. Pero, los proveedores de energía deben equilibrar las necesidades de los clientes con su propia necesidad de impulsar los ingresos y maximizar ganancias. A veces, este proceso se desequilibra. En mercados liberalizados, una competencia intensa puede conducir a ventas y actividades de marketing agresivas que pueden interferir con la capacidad de una empresa para tomar decisiones de compra informadas y conducir realmente a mayores costos. Right now you have a good chance to achieve significant savings due to the current low price environment in the energy markets. But, energy suppliers must balance meeting customer needs with their own need to drive revenue and maximise profit. Sometimes, that process becomes unbalanced. In deregulated areas of the country markets, intense competition can lead to aggressive sales and marketing activities which can interfere with a company’s ability to make truly informed buying decisions and lead to higher costs. Join us as we investigate the current state of the market and outline options available to you in order to choose the right buying strategy for your business. Right now you have a good chance to achieve significant savings due to the current low price environment in the energy markets. But, there is a danger for energy buyers even when the price seems low. In these conditions, offers of savings are flying around, people are locking prices and energy suppliers are putting lower price offers in customers' hands. It's very easy to be content delivering any savings story to your leadership, but many buyers are still leaving money on the table. Join our energy experts for a deep dive into buying strategies that every energy buyer should employ and hear tips for navigating the markets in a low energy market. A live Q&A session will follow the discussion. Your presenters each have 15+ years of energy buying experience and are excited to share with you the signs to look for as you negotiate with energy suppliers. La Unión Europea definió un objetivo ambicioso para mejorar la Eficiencia Energética de un 20% en 2020. La nueva Directiva para la Eficiencia Energética (DEE) ofrece algunas de las mejores prácticas sobre la manera de identificar las iniciativas con mayor potencial para mejorar la eficiencia, como priorizar las inversiones en proyectos de EE, y cómo garantizar que se accede a potenciales incentivos. Las medidas clave incluyen la realización de auditorías energéticas, el diseño de un sistema de monitorización de datos, la instalación de contadores inteligentes, el buen uso de los conocimientos especializados del sector, y mantenerse en la cima de la legislación nacional. ¿Qué significa para su negocio? Atienda a nuestro webinar EED – ISO50001, dónde vamos a explicar qué oportunidades están disponibles a través de la Directiva para la eficiencia energética, y también el papel de la ISO 50001. ESOS is a UK mechanism for meeting the European Energy Efficiency Directive (EED) and is a mandatory energy assessment scheme for organisations in the UK that meet the qualification criteria. 2015 is the year of ESOS. Organisations must comply with these important new regulations or risk fines for non-compliance. Make sure your organisation is ready. Reserve your seat at our virtual workshop where we'll share lessons learned, including best practice and answer our most popular FAQs. - “Saw it, Read it, Understand it?” – What have we learned so far? As companies look to expand and optimize their operations around the world, up-to-the-minute information about developed and emerging energy markets is critical to their success. Join Matt Smith and Shelby Jett for this 30-minute tour around the world where they will highlight what you need to know in key energy markets. During registration, you'll also have the opportunity to submit countries you'd like to learn more about. We'll compile the results and include a few of the most popular submissions in the webinar. Depuis le 4 juillet 2014, plus de 10.000 entreprises en France de +250 personnes ou +50 M€ de chiffre d’affaires - 80 000 en Europe - sont impactées par la Directive européenne sur l’Efficacité Energétique transposée dans la Loi DDADUE en France. Elle organise une action majeure d'amélioration de la performance énergétique sur la base d'audits énergétiques ou la mise en place d'un système de management de l'énergie ISO 50001. Pour Schneider Electric, l'ISO 50001 est LA réponse à la maîtrise des coûts énergétiques, mobilisant tous les acteurs de l'entreprise et bénéficiant d'un engagement fort de sa Direction. Avec la certification ISO 50001 - et cela quel que soit votre domaine d’activité tertiaire ou industriel - vous disposez d’un exceptionnel levier d'amélioration de votre compétitivité. Ce webinaire, dédié aux entreprises françaises - SA, SARL, EPIC, GIE etc. - éligibles à la loi DDADUE, vous présentera les dernières évolutions de cette réglementation, l’approche méthodologique de la norme ISO 50001, ainsi que les facteurs-clés de réussite d'une certification ISO 50001. The European Union has set an ambitious goal of improving energy efficiency by 20% by 2020. The new Energy Efficiency Directive (EED) offers some best practices on how to identify initiatives with the greatest potential to improve efficiency, how to prioritise efficiency investment and how to ensure available incentives are accessed. Key measures include conducting energy audits, designing a data monitoring system, installing smart meters, utilising industry expertise and staying on top of national legislation. So what does it mean to your business? Listen to our 50 minute Masterclass where we will outline what opportunities are available through the Energy Efficiency Directive including the Energy Saving Opportunity Scheme (ESOS) and ISO50001. 10.10 European Energy Efficiency Directive – What does it mean? La gestion de l’énergie est un enjeu croissant pour le secteur immobilier, dont les acteurs ont entamé une transition remarquée dans la voie du développement durable. Pour satisfaire leurs grands locataires et préserver la valeur de leurs actifs, ils se sont, ces dernières années, lancés dans des démarches de certifications de leurs bâtiments et de suivi de leurs consommations. Cependant, alors que les contraintes réglementaires et les exigences des preneurs en matière de performance verte s’accélèrent, suivre les tendances ou tenter des expérimentations isolées ne garantit plus la pérennité de son parc. La définition d’une stratégie verte globale et le déploiement de services énergétiques innovants deviennent des impératifs métier. - Quelles sont les composantes d’une stratégie verte équilibrée pour les 5 années à venir, via une double approche parc et actif ? - Quels nouveaux outils permettent de collecter les données RSE de son parc et d’en faire un levier pour se différencier de la concurrence ? - Quelle approche rationnelle permet de préparer sereinement la rénovation de ses actifs ? Would you like to save up to 5% of your annual energy budget? All for no up-front investment? Many organisations are aware of Triad charges but often are unable to avoid them. Sites which could negate charges, often have challenges with existing resilience, lack of control and aging infrastructure. Find out all you need to know about Triad charges, the impact on your business and how, with no up-front investment, you can save up to 5% of your annual energy budget, during this one hour webinar. The Energy Challenge - what can we do? Schneider Electric is the global specialist in energy management and automation. With revenues of €25 billion in FY2014, our 170,000 employees serve customers in over 100 countries, helping them to manage their energy and process in ways that are safe, reliable, efficient and sustainable. From the simplest of switches to complex operational systems, our technology, software and services improve the way our customers manage and automate their operations. Our connected technologies will reshape industries, transform cities and enrich lives.